Welcome to Brussels National Airport, gateway to the European Union! 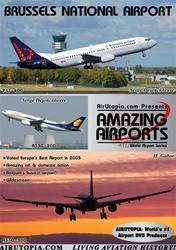 Operating to the airport alongside Belgian carriers such as Brussels Airlines and Jetair Fly are international airlines Ethiopian, Saudi Arabian, Jet Airways, EVA Air Cargo, Asiana Cargo, American Airlines, Delta Air Lines, US Airways, United Airlines, and Continental Airlines. Voted Europe's Best Airport in 2005! Amazing international and domestic action! Run time is about 60 minutes. Format is NTSC DVD and region-free.